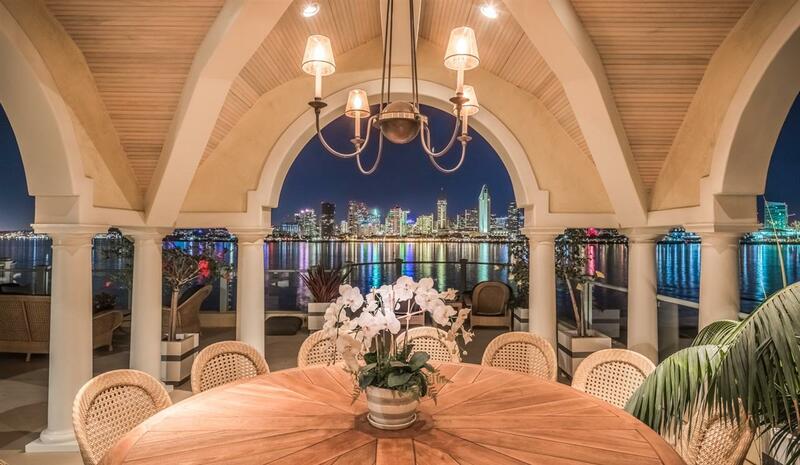 Zee Huis (Dutch for Sea House) is a one of a kind, three building compound which overlooks the San Diego harbor and offers one of the best views of the cityÃ¢â‚¬â„¢s skyline. During the day it boasts a panoramic view of sailboats and other harbor activity. At night, lights from the San Diego skyline waft across the rippling water to create a multi-colored dance of lights. This magnificent estate is being offered fully furnished. The property is situated on a private street, with an inviting curbside appeal. You enter this secured property through a set of carriage house doors where surprisingly, you find yourself still outdoors, yet in a stunning and completely private courtyard with an abundance of gardens, a lawn area, and access to the three buildings on the compoundÃ¢â‚¬â„¢s grounds. The carriage house is ideal for an extended family, staff or longer guest visits. It features two vaulted ceiling living areas, one with a fireplace and a contemporary kitchen. The suite includes two bedrooms and two full baths, with hardwood flooring and a balcony overlooking the courtyard. Its two garages hold up to five cars, includes a workshop area and a laundry room/half bath. A freestanding second building, situated in the middle of the courtyard, could be used as an office, exercise room or guesthouse. It includes a full bath, sauna room, wet bar and an adjacent exterior oversized hot tub sanctuary. The primary residence is located at the far end of the courtyard, situated on the water with a zero edge pool that appears to pour directly into the bay. This stunning nine-room building features a recently completed remodel of the main living areas. The four main house bedrooms are all en suite and include fireplaces. 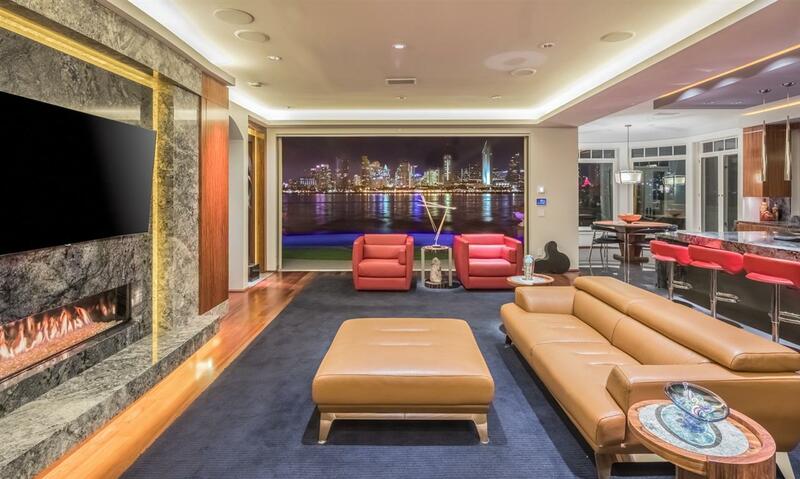 The living room features a fifteen-foot powered disappearing Fleetwood sliding glass doors that offer an unobstructed view of the harbor and the San Diego skyline. The spacious kitchen with butlerÃ¢â‚¬â„¢s pantry features cabinets made from a rare fiddle back Koa and Blue Bahia stone, with stainless accents. The kitchen is equipped with new top of the line appliances: Gaggenau cooktops (gas burners, teppan yaki and a steamer), dual Viking ovens, multiple Sub Zero refrigerators/freezers and more. The convenient first floor master suite has spacious his & hers closets and dual water closets as well as direct views of and access to the bay side yard. The warm and inviting pub is adorned with French polished mahogany panel walls and includes a wet bar, additional refrigeration, icemaker and wine cooler. The large laundry room leads to an additional two-car attached garage, which includes a powered vehicle turntable. An exterior accessed half bath provides facilities for wet pool residents as well as property workers. The second floor of the main house features two family bedrooms and a 5-star hotel quality guest room, a family room and an adjacent half bath. A spacious elevator provides access between the floors. An additional laundry room is situated upstairs for convenience. Perhaps the most dramatic feature of this property is the massive deck with a 180-degree view of the bay, from Point Loma to Petco Park, encompassing the Midway, Seaport Village and the Convention Center. 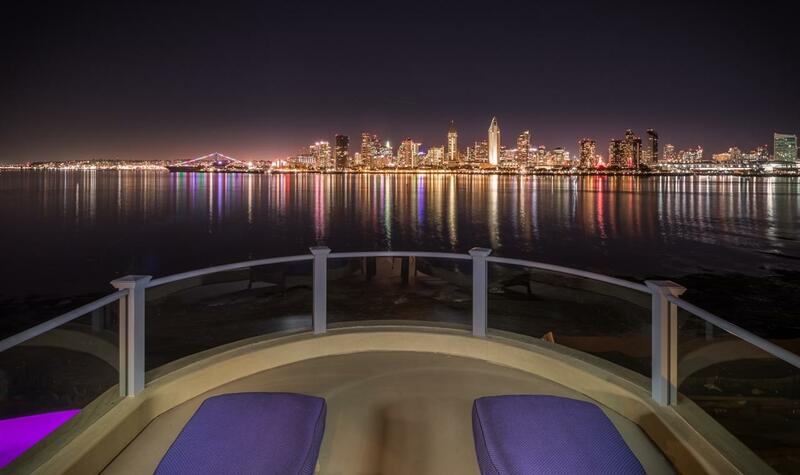 At nearly 1,500 square foot, it is easily, one of, if not the largest deck to enjoy this amazing view of San DiegoÃ¢â‚¬â„¢s skyline. The deck is perfect for entertaining intimate parties as well as hosting very large gatherings. Amenities include an exterior fireplace, wood fired pizza oven, wet bar and grill. This large deck has both covered/heated eating and seating areas, including a 12 person oversized teak dining table and ample open-air spaces. For more intimate moments, enjoy the balcony overlooking your charming and private courtyard. 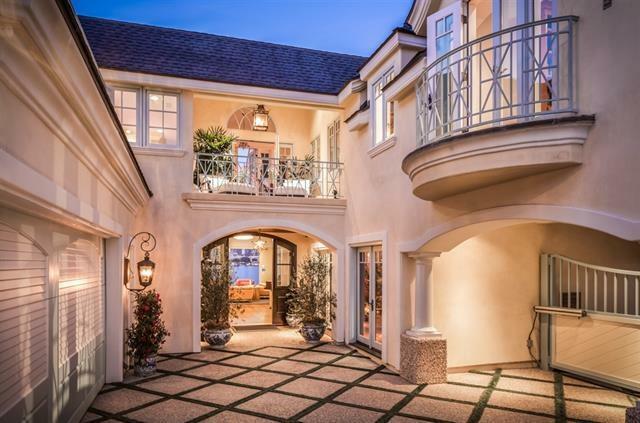 This walled and gated property not only feels like a safe and private enclave, but to ensure additional security, the property includes an extensive exterior camera monitoring system. Zee Huis provides a private world-class resort feel that must be experienced to be appreciated.